Delegrange, Susan H. “Wunderkammer, Cornell, and the Visual Canon of Arrangement” Kairos 13.2 (Spring 2009). Web. 17 Feb. 2011. Mainly written toward computer compositionist and rhetoricians, particularly those following classical rhetorics; composition and new media teachers. Written from the rhetorical stance of the researcher as inquirer and teacher, working with and reinforcing a critical tradition. Scholarship: Philosophical deduction based on critical theory, textual analysis/example, but also qualitative investigation of historical and physical artifacts (Wundermakers and Cornell’s Shadow Boxes, student research projects). That digital media presents the possibility of arranging visual arguments which invoke wonder–a state of learning which happens at the suspended moment between ignorance and first understanding. She suggests that the history of wundermakers (wonder-) offers us a rhetorical theory of arrangement, based on the assemblegde of evidence that will encourage epistemological discovery through associative-connections, which will in turn encourage ethical action. the reader/viewer to explore various perspectives and make epistemological connections not possible without the specific arrangement. 16th and 17th c. wunderkammers: cabinets of wonder or curiosity. Rooms were made up of naturalia, artificialia, and scientifica. Scientifica included insturments of measurement–such as telescopes, mirror boxes, distorting lenses, and microscopes–placed within rooms which would allow audiences to investiagte or explore other artifacts within the collection (“Manipulating”). Linnaeus’s classification system, a taxonomy birthed out of a wunderkammer (“Cabinets”). 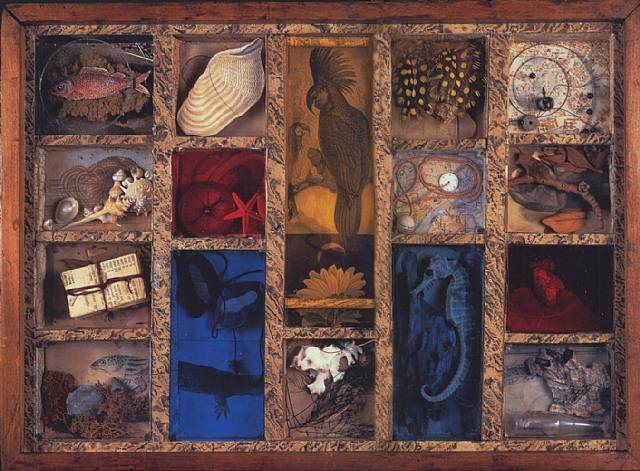 Joseph Cornell’s bricolage art work, made of often random, fond objects, placed in artistic order.They consisted of physical artifacts composed of “fact upon fact upon fact—that he accumulated about people, events, places, and phenomena” (Hartigan qtd. in Delegrange “Repitition/Small Variation”); an example of techne’s making as knowing. Cornell often revised his works, even those owned by others. He also provided “instructions” for owners on how to interact with his works–showing the knowing by doing aspect of techne media (“Making/Showing”). DVD–ROM The Magical Worlds of Joseph Cornell that accompanies the centenary celebration Joseph Cornell: Shadowplay, Eterniday; A multimedia exploration where you can rotate and take apart Cornell’s works, read his diary, listen to voices of friends or curates, and look through his collections of unused materials. Collect primary, archival data about their location–“photographs, postcards, maps, deeds, advertisements, newspaper clippings”–and compose a power point chronicalling the building’s history. Collect their own primary data about the building–their own photos, and interviews with owners, inhabitants, employees, and patrons–and draw a use-map of the building’s current use. Create a final new media proposal advocating civic involvement and future use of the space they investigated. What are the predominant similarities? differences? What seems to “go” with what? why? How are different media related? What is unexpected in this arrangement? Delegrange successfully structures her web text according to the principles she theorizes in her argument: the new media arangement juxtoposes text, images, animations and a video in such a way that they compliment, support, and reinterpret one another. The case study at the end, that is, her student’s own project, is what made this article come to life as research–because one realized that she was actually teaching research methods as a form of knowledge-making within communities/contexts; this strongly supported her epistemological claims and scholarly research. She suggests that tools of measurement can act as elements of inquiry and draws attention to the markedly subjective, yet productive perspective that they offered in the wunderkammens. She implies that arrangement can inspire invention (rather than only the other way around). This is similar to Brooke’s argument, that new topoi often emerge from qualitative data, as one tries to arrange the various observations and experiences into a meaningful whole. While Delegrane focuses on the new media aspect of her Intermediate Writing assignment, we might argue that the assignment requires students to do ethnographic, qualitative research of a space; they use archival data, explore the spaces themselves, and conduct interviews, in order to assess the value and potential of that space to a community. This entry was posted in ENC 6720 Qualitiative Methods, Visual Rhetoric and tagged Arrangement, Barbara Maria Stafford, Cannon, Composition, Delegrange, Ecological Composition, Epistemology, Joseph Cornell, Kairos, New Media Composition, Qualitiative Research, Scholarship, video, Visual Analogy, visual rhetoric, Wunderkammers.